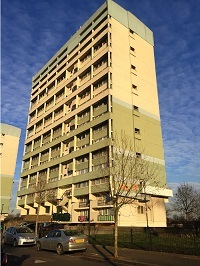 The London Fire Brigade is staging a series of training exercises in a Leytonstone tower block to test our response to high rise emergencies in Waltham Forest. Four separate exercises will be staged on 5, 7, 9 and 19 September to test the skills of our firefighters across all four watches at the station's taking part. All four exercises will be taking place at the 17-storey John Walsh Tower on Montague Road between 11am and 2pm. Deputy Assistant Commissioner for the North East area Allen Perez said: "It is crucial that our crews are prepared to deal with a wide range of emergencies and this is one of a number of training exercises that we carry out each year. "The exercises we are staging in Waltham Forest throughout September are a valuable chance for our crews to further practice their response to high rise fires and the high rise property provided to us by Waltham Forest Housing will give us a unique opportunity to test that response in a realistic environment." Six fire engines, a command unit and around 40 firefighters from Leytonstone, Leyton, Walthamstow, Woodford, Ilford and Stratford fire stations will be attending each exercise. In recent years the Brigade has put in place a number of further improvements to its response to high rise emergencies. These include improving the information available to firefighters on the location and lay-out of residential high rise buildings and having a dedicated Incident Command Unit at the scene of all high rise incidents where people are believed to be inside. The Command Unit liaises with 999 Control Officers who give fire survival guidance to people who may be trapped. Those details are then relayed to firefighters on the ground, so they receive accurate information quickly about the location of any people who require rescuing. Deputy Assistant Commissioner Perez added: "The exercise also highlights the importance of having a fire safety plan and knowing what to do in the event of a fire if you live in a high rise or purpose built flat. "Living in a flat is not more dangerous than living in a house, but it's important to know that your fire plan should be different. "Flats and maisonettes are built to give you some protection from fire so if there is a fire elsewhere in the building but not inside your home you're usually safer staying in your flat unless heat or smoke is affecting you."